1 2 Ghazanfar, A. A.; Nicolelis, M. A. (2001). "Feature Article: The Structure and Function of Dynamic Cortical and Thalamic Receptive Fields". Cerebral Cortex. 11 (3): 183–193. doi:10.1093/cercor/11.3.183. PMID 11230091. 1 2 3 Theunissen, F; David, SV; Singh, NC; Hsu, A; Vinje, WE; Gallant, JL (2001). "Estimating spatio-temporal receptive ﬁelds of auditory and visual neurons from their responses to natural stimuli". Network: Computation in Neural Systems. 12 (3): 289–316. doi:10.1080/net.12.3.289.316. PMID 11563531. 1 2 Baird, A.; Samson, S. V. (2009). "Memory for Music in Alzheimer's Disease: Unforgettable?". Neuropsychology Review. 19 (1): 85–101. doi:10.1007/s11065-009-9085-2. PMID 19214750. ↑ Bailey, D.L; Townsend, D.W.; Valk, P.E. ; Maisey, M.N. (2003). Positron Emission Tomography: Basic Sciences. Secaucus, NJ: Springer-Verlag. ISBN 1852337982. 1 2 3 4 Hauk, O; Wakeman, D; Henson, R (2011). "Comparison of noise-normalized minimum norm estimates for MEG analysis using multiple resolution metrics". NeuroImage. 54 (3): 1966–74. doi:10.1016/j.neuroimage.2010.09.053. PMC 3018574 . PMID 20884360. ↑ Fitzgerald, P; Fountain, S; Daskalakis, Z (2006). "A comprehensive review of the effects of rTMS on motor cortical excitability and inhibition". Clinical Neurophysiology. 117 (12): 2584–2596. doi:10.1016/j.clinph.2006.06.712. PMID 16890483. ↑ Brown, S.; Martinez, M. J.; Parsons, L. M. (2006). "Music and language side by side in the brain: A PET study of the generation of melodies and sentences". European Journal of Neuroscience. 23 (10): 2791–2803. doi:10.1111/j.1460-9568.2006.04785.x. PMID 16817882. ↑ Jentschke, S.; Koelsch, S.; Sallat, S.; Friederici, A. D. (2008). "Children with Specific Language Impairment Also Show Impairment of Music-syntactic Processing". Journal of Cognitive Neuroscience. 20 (11): 1940–1951. doi:10.1162/jocn.2008.20135. PMID 18416683. ↑ Stewart, L.; Walsh, V.; Frith, U. T. A.; Rothwell, J. (2006). 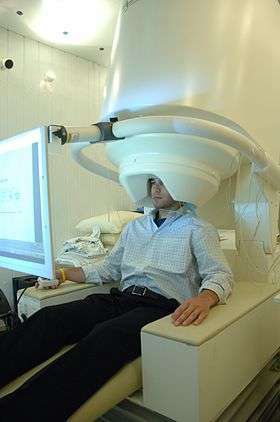 "Transcranial Magnetic Stimulation Produces Speech Arrest but Not Song Arrest". Annals of the New York Academy of Sciences. 930: 433–435. doi:10.1111/j.1749-6632.2001.tb05762.x. PMID 11458860. ↑ Granier-Deferre, C; Ribeiro, A; Jacquet, A; Bassereau, S (2011). "Near-term fetuses process temporal features of speech". Developmental Science. 14 (2): 336–352. doi:10.1111/j.1467-7687.2010.00978.x. PMID 22213904. ↑ Gross, W; Linden, U; Ostermann, T (2010). "Effects of music therapy in the treatment of children with delayed speech development -results of a pilot study". BMC Complementary And Alternative Medicine. 10 (1): 39. doi:10.1186/1472-6882-10-39. PMC 2921108 . PMID 20663139.